Through the field beyond the trees lies the ocean…..
A premier of a new musical suite – a concert to be held in the picture gallery and the music room at Hospitalfield commissioned specifically for the Summer Festival 2018. This is an opportunity to hear a specially composed work by the renowned Dundee based musician and producer, Andrew Wasylyk. Through a series of residencies and visits throughout the winter and spring, Wasylyk has composed a suite of musical pieces inspired by this coastal location and in collaboration with the harpist Sharron Griffiths. 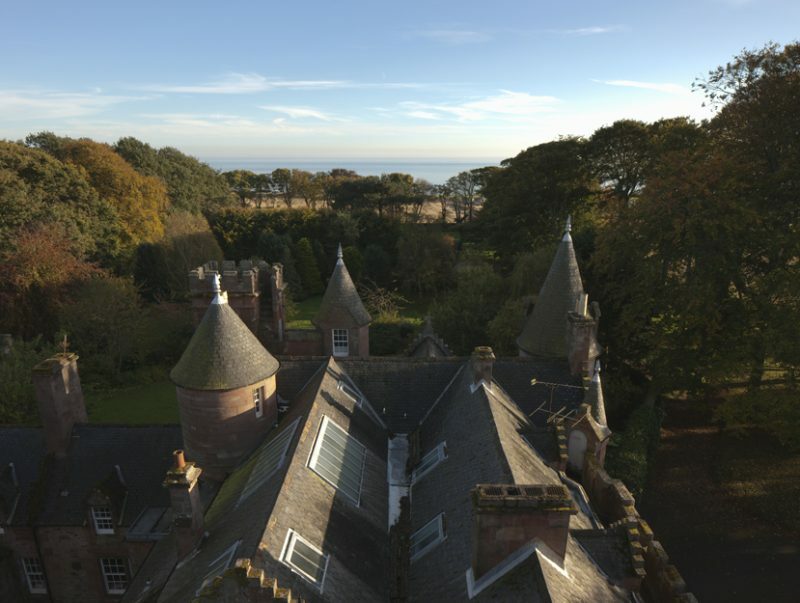 His short musical studies focus on the Gothic style architecture of the house and its unique relationship with the looming North Sea horizon. The work will be presented on the evening of Saturday 23rd June in a live performance moving from one room to another. His compositions include the use the instruments that we have in the house with a particular focus on the recently restored Erard Grecian Harp which will be played by esteemed harpist, Sharron Griffiths and ensemble. We are excited to be able to invite you to experience this performance designed specifically for Hospitalfield, a premier of the new works that will feature in Wasylyk’s new album. This concert will be the first opportunity to order this new album of works on vinyl. Sharron Griffiths has appeared as a soloist, chamber and orchestral musician in recitals both on the concert platform, recording and radio broadcasts, playing at many prestigious concert halls all over the world including the Royal Albert Hall and the Concertgebouw, Amsterdam. She works regularly with Royal Scottish National Orchestra, BBC Scottish Symphony Orchestra, Trondheim Symphony Orchestra among others; and has freelanced with several International orchestra’s, including the BBC Symphony Orchestra, Arctic Philharmonic Orchestra, The Orchestra of the Age of Enlightenment, Royal Ballet Sinfonia and Northern Ballet Company. Griffiths has also held harp positions on West End and Touring Musicals along with playing for many pop and film sessions, including sessions at the famous Abbey Road studio’s, and with artists such as Pavarotti, Idina Menzel, Katherine Jenkins, Alfie Boe and Russel Watson. Griffiths has also performed as a member of diverse ensembles and collaborated with many other musicians, composers and singers including Sally Beamish, Eddie McGuire, Alasdair Nicolson, Gareth Williams, Graham Hair and Martin Suckling. 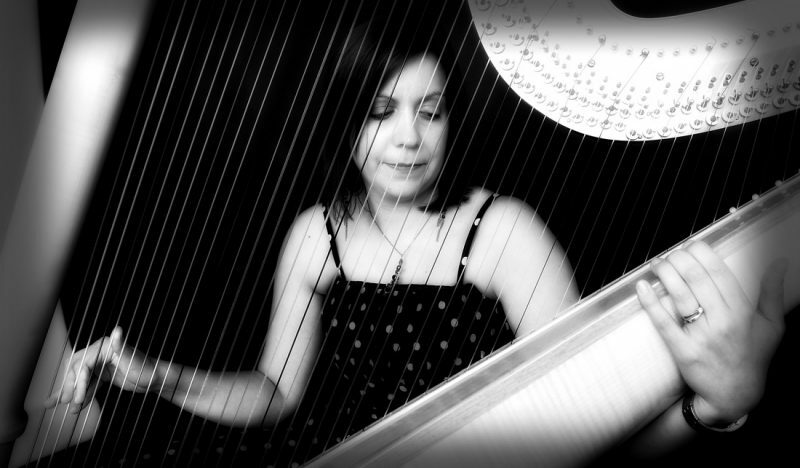 She is also a Lecturer of Pedal Harp at the Royal Conservatoire of Scotland and a regular harp tutor for the National Youth Orchestra’s of Scotland. Andrew Wasylyk is the alias of Scottish writer, producer and multi-instrumentalist, Andrew Mitchell. He has released two solo albums; Soroky, in 2015, the title of which, like the Wasylyk name, is framed by his Ukrainian heritage and 2017’s acclaimed, Themes For Buildings and Spaces; a homage to architectural sites and open spaces in his hometown of Dundee. These inspired an album of instrumental compositions echoing the materials, the everyday use and the romanticised memories of a post-war cityscape shifting and evolving throughout the decades. Andrew has also released six albums with Dundee band The Hazey Janes, is one half of experimental, psych-duo Art Of The Memory Palace and has an array of past collaborations with writers and musicians, including previous Scottish poet laureate, Liz Lochhead, celebrated novelist, James Robertson and indie cult group, Idlewild. 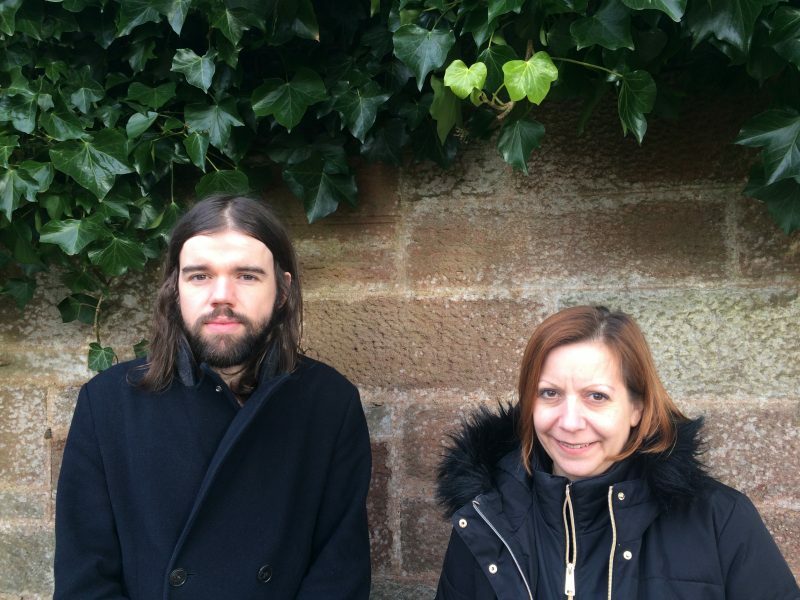 Drawing on a rich pool influences ranging from contemporary-classical, to ambient, through to cinematic soundscapes, Hospitalfield is delighted to bring these two creative artists together for what will be a unique and immersive project. 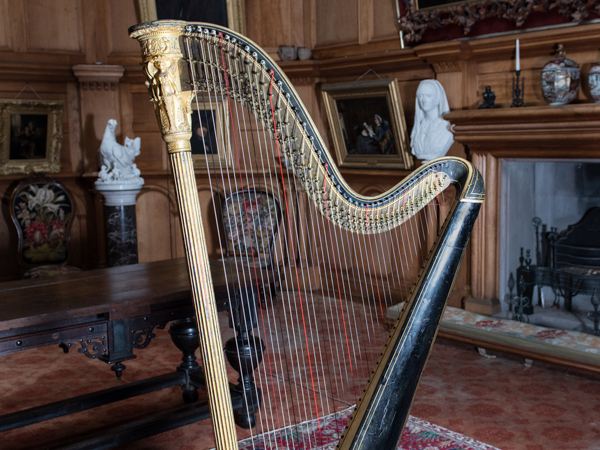 In 2016 Hospitalfield run a crowdfunding campaign to enable the renovation of the Grecian Erard Harp, and after receiving it back from the expert craftspeople at Pilgrim Harps, hosted a recital by Sharron Griffiths in the summer of 2017. Sebastian Erard was born in Strasbourg on 5th April 1752. 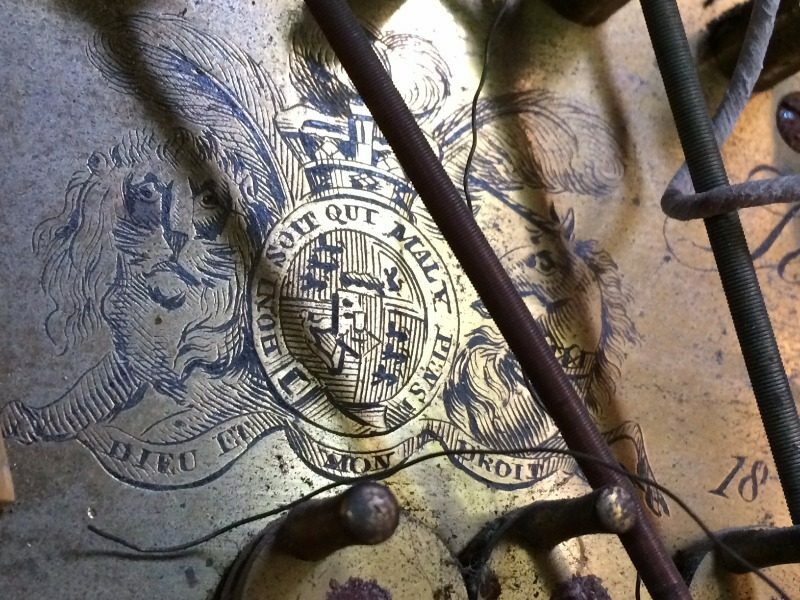 He moved to Paris in 1768 to explore the fundamentals of instrument making, and it soon became apparent that he was a genius at finding ways around mechanical problems. In 1792 he opened a factory in Great Marlborough Street, London where he made several patented advances in harp technology. Finally, in June 1810, after eight years of working on it, Sebastian Erard patented the double-action harp with seven pedals (number 3332). This is regarded by most people as the date of the invention of the concert harp. 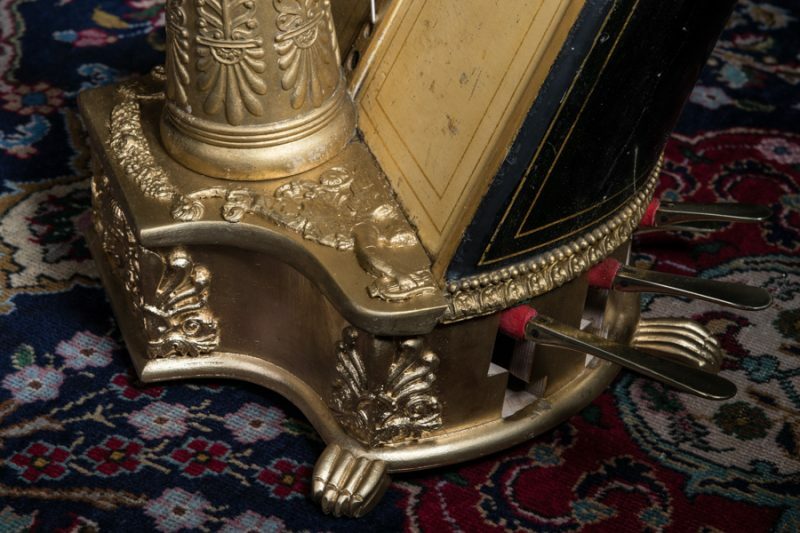 The instrument had one pedal for each note. It is reported that Erard did not undress for three months before his harp was finished, snatching meals with pencil in hand and sleeping for an hour now and again. 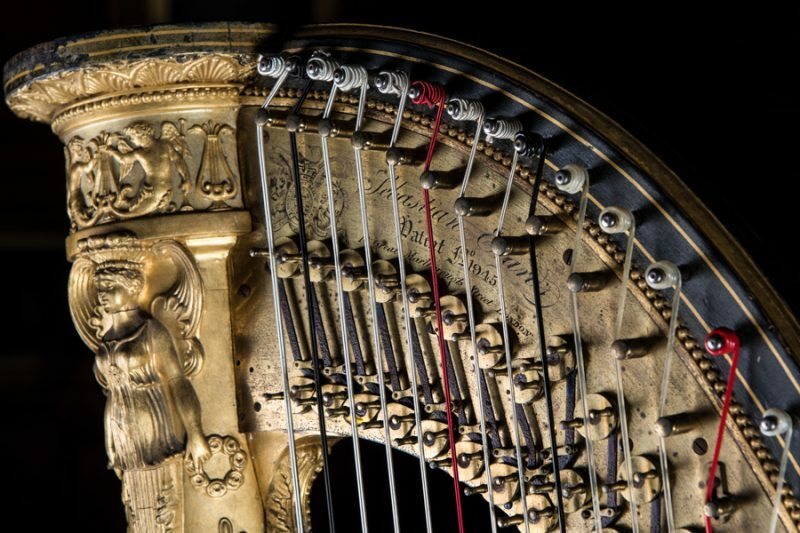 This is the type of harp that was bought by Elizabeth Allan Fraser in 1834.